Dovo 1196865 Straight Razor, 6/8 Inch Full Hollow Ground Stainless Steel Blade, Spanish Oak Handle, Germany. 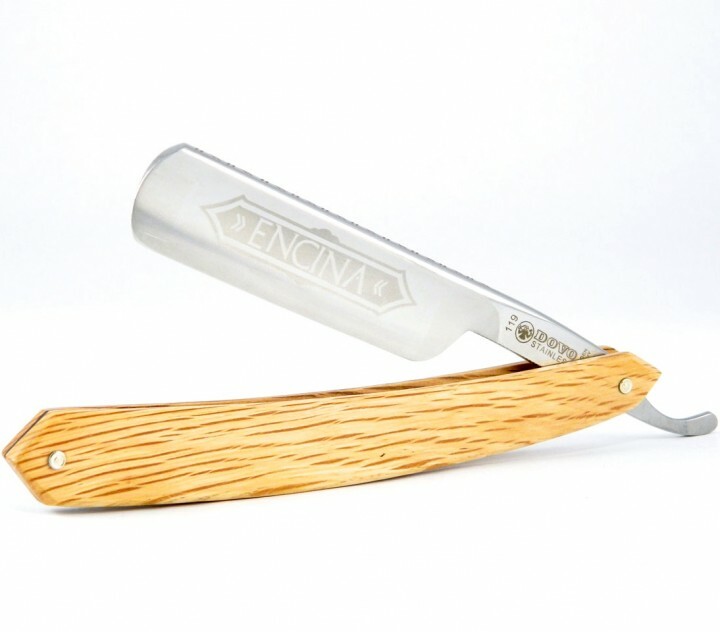 This Dovo Encina striaght razor with a Spanish Oak handle is a skillfully crafted piece of work. The stainless steel open blade of the Encina razor features satin etching. The blade depth is 6/8″ and is full hollow ground. The Spanish Oak scales have a beautiful natural grain. Dovo handcrafts their straight razors in Solingen, Germany, the “City of Blades” that is known for producing the world’s finest swords, knives, scissors and razors. Today, the “Solingen” mark is synonymous with high quality and superb design and 90% of all German knives are made in Solingen. The Solingen tradition of metal-working began with Medieval sword smiths and the specialized expertise has been passed down through the generations. Dovo blades are crafted using the same methods of blank forging, ice tempering, hardening, grinding, honing and polishing. Each blade is finished with a 24K-gold Dovo logo. Dovo strives to exceed the high standards set by the early sword smiths by handcrafting high quality, functional straight razors of superb design.